Two years ago I documented a blue whale foraging ground in an area of New Zealand called the South Taranaki Bight (STB) – the country’s most industrially active marine area with intense oil and gas exploration and extraction since the 1970’s, elevated vessel traffic, and potential seabed mining (Figure 1). Over just five days of survey effort we observed 50 blue whales and documented foraging behavior. But we still know next to nothing about where and when blue whales are in the STB, how many whales use this area, how important this area is as a feeding area, or to what population the whales belong. Without answers to these questions effective management of human activities in the region to protect the whales and their habitat is unfeasible. I am now heading back to New Zealand to collect the data needed to answer these questions that will enable successful management. That’s my goal. Figure 1. 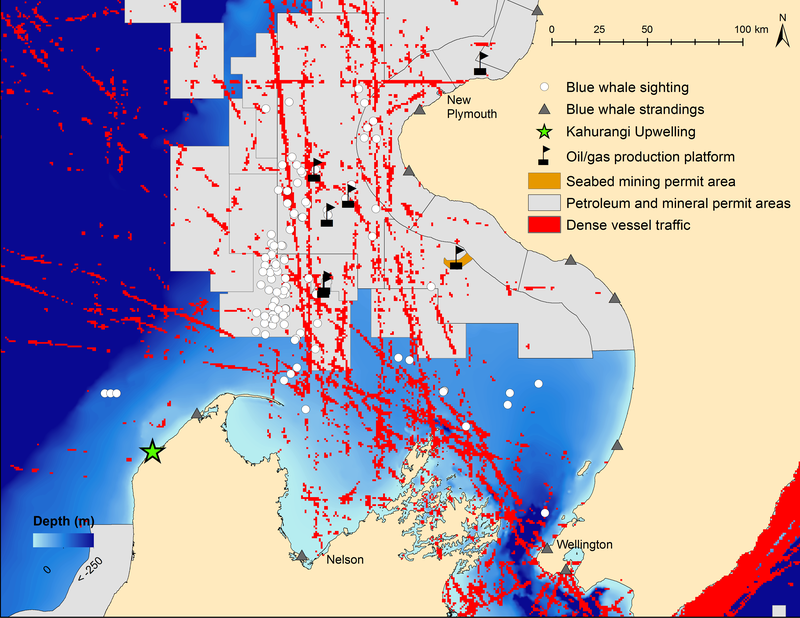 Illustration of a space-use conflict between industry activity and blue whales in the South Taranaki Bight, which lies between the north and south islands of New Zealand. Blue whale sightings and strandings recorded between 1970 and 2012. Such research costs money. In collaboration with the Bioacoustic Research Program at Cornell University (birds.cornell.edu/brp), we are deploying five hydrophones to listen for blue whales across the region for 2 years. We will conduct vessel surveys for 1 month in each year to find whales and collect data on their habitat, behavior, and individual occurrence patterns. As far as field research projects go, this work is not very expensive, but we still need to pay for vessel time, equipment, and personnel time to collect and analyze the data. This is an ugly truth of scientific research – it costs money and there is not a lot out there. For two years I’ve had my fund raising hat on (Not my favorite hat. I much prefer my research hat). I believe that industry groups active in the STB should take an active role in supporting the necessary research. They exploit the natural resources in the region and should therefore take responsibility for ensuring the ecosystem’s sustainability and health. Right? They did not agree. I emphasized to these groups that by supporting the project they would demonstrate their environmental responsibility and ultimately be engaged in discussions of management options based on project findings. Despite hundreds of emails, phone calls and discussions, all the oil and gas companies, the seabed mining group, and the maritime traffic organization declined to fund the project, claiming lack of funds or lack of relevance to their interests. Meanwhile, other groups who prioritize conservation management are supporting the project. I am grateful to The Aotearoa Foundation, The National Geographic Society Waitt Foundation, The New Zealand Department of Conservation, Greenpeace New Zealand, OceanCare, Kiwis Against Seabed Mining, and an anonymous donor. Lately I have been reading Sheryl Sandberg’s poignant book, Lean In, which I feel is a call to women to take responsibility for our equality and leadership. Those familiar with this book will recognize the opening of my blog title from her valid push for women to take more risks and push ourselves beyond our comfort zones. In many ways I feel I am doing this now. It would be much easier for me to withdraw from this project, say I tried, and let things carry on until someone else takes the challenge. Funding is short, last minute contract issues abound, equipment logistics are running late, I fear political pushback, and I have a sore throat. But it’s time for this project to happen. It’s time to recognize biodiversity’s innate right to healthy habitat. It’s time for industry groups to acknowledge their potential impacts on blue whales through elevated ocean noise, vessel strikes, and habitat degradation and displacement. It’s time for management to have the tools to act. Figure 2. 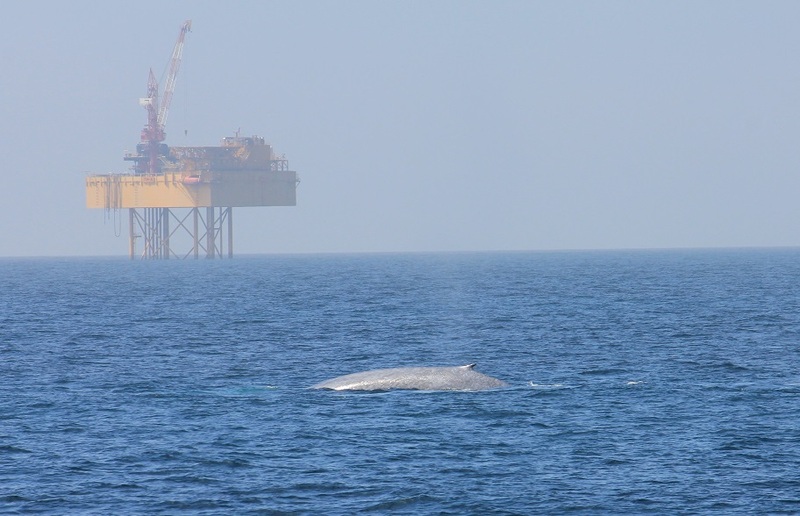 A blue whale surfaces in front of an oil rig in the South Taranaki Bight, New Zealand. Photo by Deanna Elvines. I remain hopeful that industry groups will engage in this research effort. Through diplomacy, transparency and robust science I want to bring together industry, NGOs, and management groups to develop effective conservation strategies to protect blue whales and their habitat in the STB. Collaboratively we can balance industry activity and biodiversity protection. Since reading Lean In, I’ve been wondering if the conservation movement suffers because of women’s reluctance to challenge, take risks, and ‘sit at the table’ as Sandberg says. The conservation field is heavily dominated by women. For progress to happen we must be willing to force issues, be perceived as aggressive, and not be nice all the time. Just like men are expected to be. Over the next four weeks colleagues and I will conduct research in the STB on blue whales. Stay tuned to this blog for updates. Thanks For Sharing. I Really Like This Blog.